We bring you the best gadgets for men available on Amazon this February. As always, we’ve included something for everyone, so you can choose the perfect gift for a man you know and love or just reward yourself for all the hard work you’ve done this month—you deserve it! It doesn’t matter which socket size you need because you’re guaranteed to always find every other size except for the right one. But with this universal socket from Kusonkey, you won’t have to keep track of many different sockets because its unique design automatically adjusts to any socket size and shape. Inside this universal socket are 54 hardened steel spring pins that automatically retract when pushed against a bolt head to match its shape. The pins can accommodate all bolt heads from 7 to 19 mm in diameter, making this universal socket perfect for anyone who works on cars, motorbikes, or boats. Of course, a universal socket like this is also fantastic for homeowners who do their own house repairs as it can replace a much more expensive set of wrenches and is compatible with all cordless drills. Get it here. Hot weather is finally coming, and that means working outside in the sun. It’s no secret that great music can make even the most tedious work a much more enjoyable. The problem is finding a Bluetooth speaker that can last long enough on a charge to keep your spirits high from dusk to dawn. The ZeroLemon SolarSound has absolutely no problems with battery life because it features a large 10,000 mAh battery and comes with a built-in solar speaker, theoretically allowing to listen indefinitely without ever taking a break. You can connect to the speaker via Bluetooth or 3.5 mm audio jack and control it either from your smartphone or using the built-in control buttons. Inside the speaker is a 10-watt driver, which may not sound like much until you realize that most PC speakers without a dedicated subwoofer also have around 10 watts of power. Get it here. The ANNKE Nova S is an extremely versatile IP camera that can take on many different roles. It can be used as a security camera, you can take advantage of its built-in speaker and microphone and use it as a web camera, and you can even connect it to ANNKE’s cloud and access it from anywhere and at any time. Unlike many other IP cameras, the Nova S is exceptionally easy to install, and it costs only $50. Its high-resolution sensor records video in 1080p and provides 115˚ horizontal and 135˚ diagonal wide-angle vision to eliminate blind spots. Because the Nova S is compatible with IFTTT, a free web-based service to create chains of simple conditional statements, you can effortlessly program it to trigger various actions to make your home smarter. Get it here. Every man has at least a few uses for a reliable thermal camera such as the FLIR TG165. With the TG165, it’s possible to easily see what’s hot, which can be tremendously useful when troubleshooting faulty appliances, car engines, HVAC problems, or electrical wiring. Even though the TG165 is equipped with FLIR’s exclusive Lepton micro thermal sensor, the camera has been designed with home users in mind, so no special training is required to use it. The FLIR TG165 is compact and durable, and the sensor is covered by a 10-year warranty. Get it here. 3D printing is an exciting and useful hobby. Being able to create actual physical objects from scratch with nothing but inexpensive filament and 3D modeling software fuels creativity and leads to ingenious solutions to what would otherwise be very annoying problems. The FlashForger Finder 3D printer is a fantastic printer for a complete beginner as it comes with easy-to-use 3D printing software and comes ready right out of the box. The Finder features an intuitive calibration detection system that takes care of the printer’s adjustment, and it sports 3.5-inch HD IPS touchscreen with big, easy to understand controls. 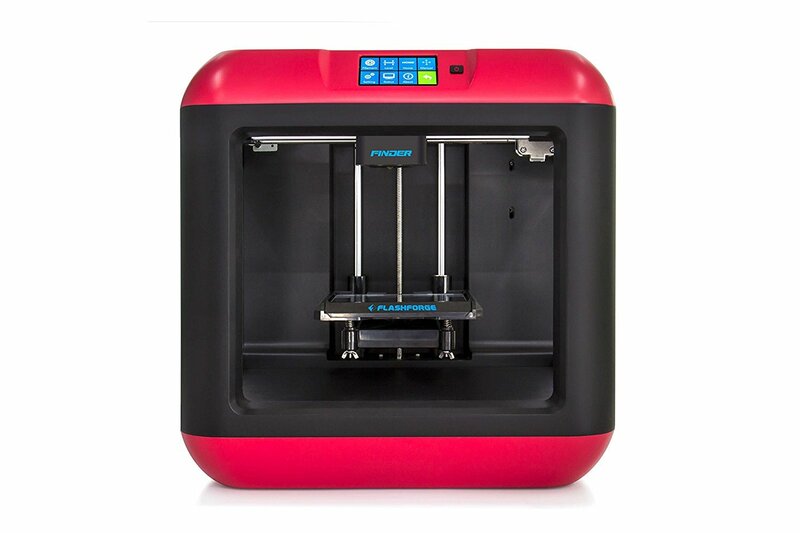 It takes only 4 taps on the screen to start printing, and the printer is compatible with all PLA filament, which is readily available in multiple colors. Get it here.